The ultimate goal is to use "Super Groups" in a manner that maximizes the handling of many Talkgroups on only 2 Timeslots while efficiently allowing for independent traffic on each IPSC network on a c-Bridge. If you only use 2 or 3 talkgroups on your 2 Timeslots, you don't need to look further. This page is targeted more to the power administrator that wants to provide more Talkgroups to his repeater owners on their IPSC network but lessen the bonks and irritations from other IPSC Network Talkgroup traffic. This should limit negative impact to repeaters on each IPSC network. The approach works well for networks with statewide or regional Talkgroups as it can provide more priority to their network specific Talkgroups over the national Talkgroups. Please keep in mind, that for this use of more Talkgroups, one must be willing to give a little. If you are frustrated by having to wait 500 ms longer to get a talk permit tone in order for the c-Bridge to arbitrate call handling via Transmit Interrupt, then you should read no further. You must be willing to be more flexible as there are over 40 talkgroups in use on all the networks for only 2 Timeslots. In the c-Bridge programming, the goal is to create a Bridge Group (Talkgroup and Manager binding) that can be managed independently to function on each IPSC network. 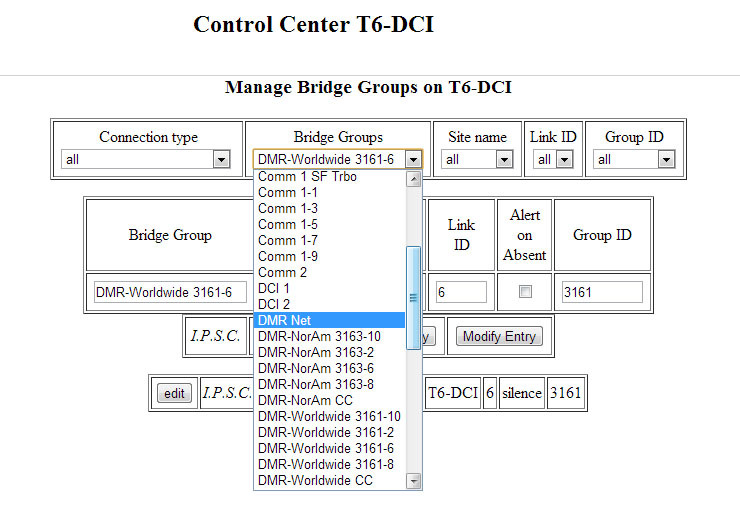 This sample page will use the DMR-Worldwide feed as the source and the "Bridge Groups" as the destinations. The connections are fixed on some IPSC networks and variable on others. All aspects of the scheduler programming will be used in this sample. A Bridge Group must be created first. They are broken out by each manager/TG ID combination. A discrete Talkgroup ID number may be used more than once if the Bridge Group name is different and this is the key to single manager/Timeslot control variations in "Super Groups". DCI uses a naming convention that is descriptive so that it simplifies visualizing how "Bridge Groups" fit into the "Super Groups". This eliminates the need to have a look-up chart or extensive notes. This page will show how DCI implements the DMR-MARC Worldwide Talkgroup feed. We manage the feed likely very differently from any other c-Bridge. This page will show how to use EVERY feature available in Super Groups. We recommend that you 3 browser tabs, one for "Net watch", one for "Bridge Groups" and one for "Super Groups". "Net watch" is used so you can see near instantly how your changes in "Bridge Groups" and "Super Groups" actually are handled by your c-Bridge. 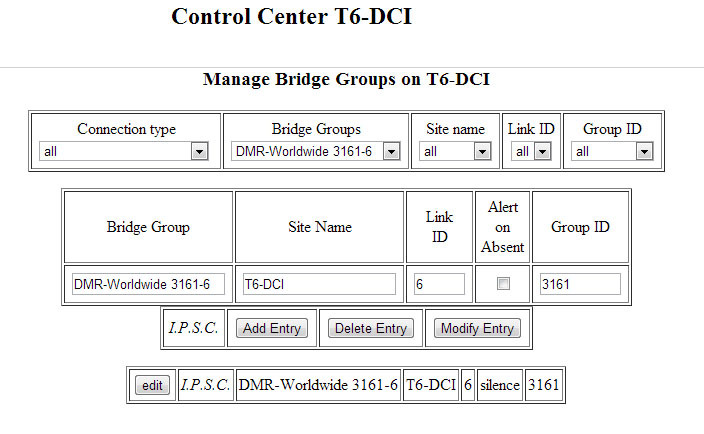 The "Bridge Groups" drop down menu shows a series of Talkgroup and time slot manager bindings at the bottom which begin with the name DMR-Worldwide. The CC is the control center connection which is the Worldwide feed from the DMR-MARC c-Bridge. The 2, 6, 8 and 10 represent 4 of the 5 Timeslot 2 manager bindings to our Talkgroup ID number (3161). The Bridge group 3161-6 is our Bridge Group binding of Worldwide (3161) to Timeslot 2 of IPSC manager 3, which is 6 or the sixth of the 10 managers found on a 5 network c-Bridge. These bindings are repeated for 3 additional managers and are the needed building blocks to enable "Super Groups" to tie the various "Bridge Groups" and the feed together for the scheduler and Talkgroups to control. 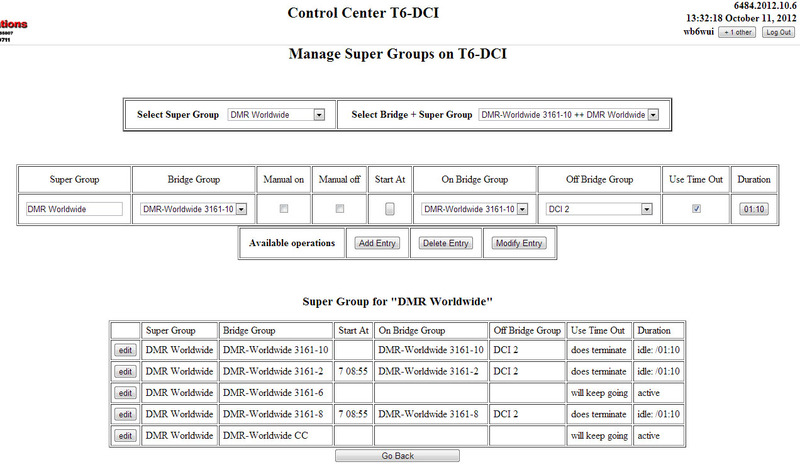 You can see the feed and the 4 "Bridge Groups" are bound together as a "Super Group" named simply: DMR-Worldwide. The feed (CC) is always enabled with no changes in status. In our example, 3161-6 is always connected, so the CC and 3161-6 are always bridged, 7/24 full time. 3161-2 and 3161-8 have all 4 possible actions enabled. "Start at" turns on Worldwide 5 minutes before Saturday Net time (local time). "On Bridge Group" enables any user on these two managers to turn on Worldwide on demand just by Ker-Chunking that talkgroup. "Off Bridge Group" disconnects Worldwide with a Ker-chunk of the DCI 2 talkgroup. Lastly "Use Time Out" sets a timer that allows the talkgroup to go dormant from the feed after 70 minutes has elapsed which allows for an hour and 5 minutes of net time each Saturday. These 2 Bridge Groups" run on two statewide networks and enables them to use Worldwide on demand but not routinely listen to the traffic nor busy out the timeslot when local or other use of Talkgroups needs the priority. If you have "Bridge Groups" that are always full time with no need to change their status, you can continue to use "Bridge Groups" only. Otherwise, do the bridging in "Super Groups" as it's very simple to change the bridging without loosing the basic programming created in the Bridge Groups, especially so if you have Conference Connections. "Super Groups" enables more control of the Timeslot traffic at the IPSC network so that each can have more control over the flow of traffic into their IPSC network. See our schedule. Using the same "Off Bridge Group" talkgroup will disconnect all IPSC network that have that common Talkgroup. Would suggest using a statewide TG or other handy regional or local Talkgroup for the off function so as not to turn off a Talkgroup that may be active on another IPSC network. This applies to the "On Bridge Group" talkgroup also but the example used for this page actually does use a different "Bridge Group" so no issue. One might consider using a talkgroup that generally has a higher priority than the "Bridge Group" being controlled. Using "On Bridge Group" TG's to control Conference Connections enables either end of the pipe to turn on both ends of the pipe. This is a very nice feature for linking statewide or regional talkgroups especially and insures that the TG at one end actually makes it out the end even if one or both ends had been turned off. Very short time-out timer settings are very handy to free up the timeslot for other traffic for more efficient use of multiple TG's on the same timeslots. There is a "Turn Off" countdown timer but no "Turn on" countdown timer. While there is an absolute time setting to turn on a "Bridge Group", it is a one shot and doesn't do the reverse of the "Use Time Out" timer. That would be a handy feature to add to the tool kit. For a work-around, just create multiple Super Group entries that have a different on time schedule. If you create 4 entries, 6 hours apart, you have 4 times a day to reset an entry back to the default on or normal. We may have some of the info here wrong, if so, we would appreciate your comments, suggestions and/or corrections.